Additional information was added along with an image showing the proper placement of the Bar emblem! I did NOT read the entire Supply Bulletin; the bar goes BELOW, not ON TOP of the unit number(s). This posting was revised with that change; and there is a link to a BSA flyer announcing the new emblem Thanks to Ken and his District professional team for finding the flyer! We recently started a Scout Troop to support the boys in my area and I located a “Founders” patch at the scout shop that seems to recognize the leaders and scouts that start units. Unfortunately, I can’t find anywhere that indicates where on the uniform we can put the patch. Have you seen anything that will help?" You are correct as to why the strip was created. 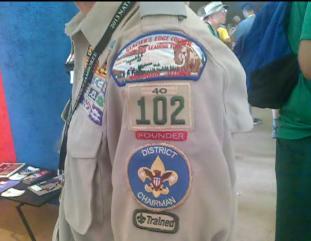 The "Founder" strip is a strip which is supposed to be worn by those founding youth and/or adult members of a brand new Scouting unit (the "Charter" or "starting" members of that unit --those who register with the unit during it's first year of operation). It is considered a "permanent emblem" as long that person is registered with that unit. 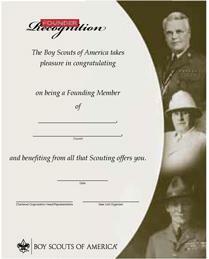 ONLY those who appear on the first charter of the unit may wear the "Founder" emblem. It is designed to encourage new unit growth and to honor those "original members". There is also a certificate (see scan of certificate below) and even a pocket card (I don't have a scan of it but it is a smaller version of the certificate). 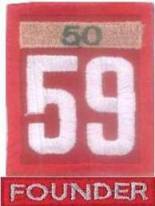 The strip is worn between the bottom edge of the unit number and the top edge of the position patch. Additionally, the BSA Supply Bulletin from March 2010 states that brand new units can "special order" their unit number with the "Founder" strip pre-sewn (embrordered) in the position, so that only one emblem -- the unit number -- needs to be sewn on. However, in talking with the Supply Group several times between 2011 and 2013, the previous information was incorrect: the strip is NOT DESIGNED to be worn "as a composite emblem" with unit numbers, either the red/white or olive/tan combinations. It is designed to be worn SEPARATELY and BELOW the unit numbers so as only those who are "members from the start" of the unit may wear the Founder strip; while all other subsequent members and leaders wear the unit numbers without the strip. Thanks for asking me -- and I do apologize for the lateness in responding back to you! Credits: Scans courtesy of Mike Walton.